What is Monster Assault Energy Drink? Monster Assault Energy Drink is essentially a subsidiary of the Monster Energy drink, but with a message hidden amongst the camo. The drink says that it is neither pro or anti-war, but it is supposed to 'fire you up' to fight off the huge multinational companies. Monster Assault Energy comes in the fruit punch flavor, and besides that and the camo pattern, I can't really see what makes it that different from a regular Monster energy drink. Monster Assault Energy contains 200 calories, 160mg caffeine, and the usual blend of things that you find in a typical Monster energy drink, which I've highlighted in the ingredients list below. Where is Monster Assault made? Monster Assault Energy is made by the Monster Beverage Corporation, which is located in the United States. Besides the Monster Assault Energy, there are 34 other drinks in the Monster drinks line, which include other drinks like Monster Lo-Carb, Monster Absolutely Zero, Monster Import, Monster Bio Activated, and Monster Energy Gronk. The ingredients in bold at the bottom are part of the special 'Monster Energy Blend' that is present in all energy drinks under the Monster brand. The amount of caffeine in Monster Assault Energy is definitely pretty high, at 160mg. Considering that your daily caffeine consumption should not go over 400mg of caffeine, this puts you at about half of your daily limit. Monster is definitely one of the drinks with a much higher caffeine content than other options. Be careful not to consume more than one of these drinks per day, and also watch out if you're consuming other caffeinated products alongside this. The bottom of the can reminds you to consume this responsibly- women who are pregnant and nursing, children under the age of 18, and people who are sensitive to caffeine should not consume too much of this drink. You probably shouldn't consume this drink on a daily basis either, because with the high amount of caffeine and sugar, it's not very beneficial for your health. 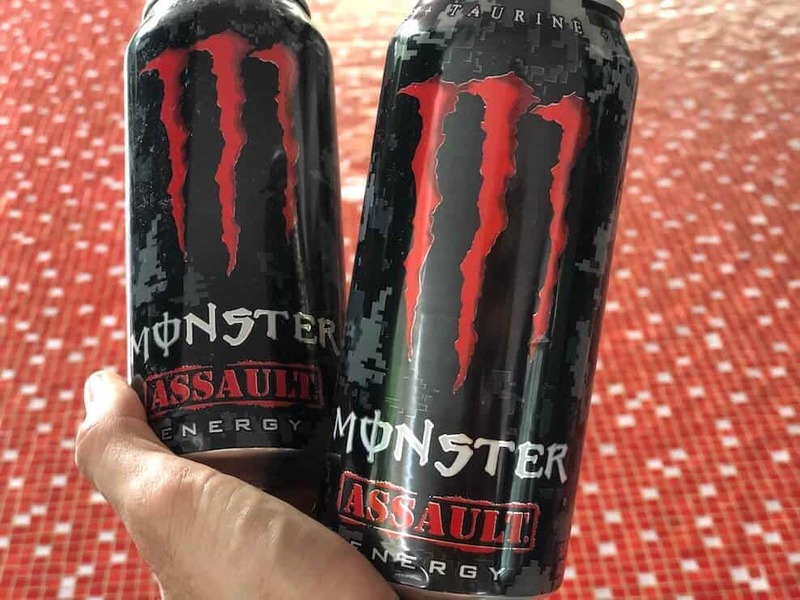 Monster Assault is pretty much your standard energy drink, and it's very similar to regular Monster, with the exception that it has just slightly less caffeine and sugar in it. An 8 pack of 16 fl.oz Monster Assault Energy costs $24.99. This means that a single can costs $3.12- not too bad for a 16 fl.oz energy drink, it's not as expensive as some of the 'organic' energy drinks out there, but it's not that cheap either. This does make it quite an affordable energy boost for those looking for something that has a good taste and also isn't too expensive. However, if you're looking for something with a great taste, and also a great price, try out REIZE Energy Drink, a powdered energy drink that does not compromise on taste and ingredients, but delivers a great energy boost at a very affordable price - get it shipped directly to your door for around $1 a drink. You can easily buy Monster Assault Energy online on Amazon, or on Energy Drink Outlet. However, be warned- some of the packs on Amazon have around 24 drinks, so make sure you're really committed to drinking it before getting such a huge pack. Buying from the Energy Drink Outlet gives you a bit more freedom to pick and choose what you want - you can make a mix and match 8 pack, buy a pack of 16, or just buy a single can! Of course, just buying a single can isn't really that worth it, but hey, it's nice to have the option to do so. 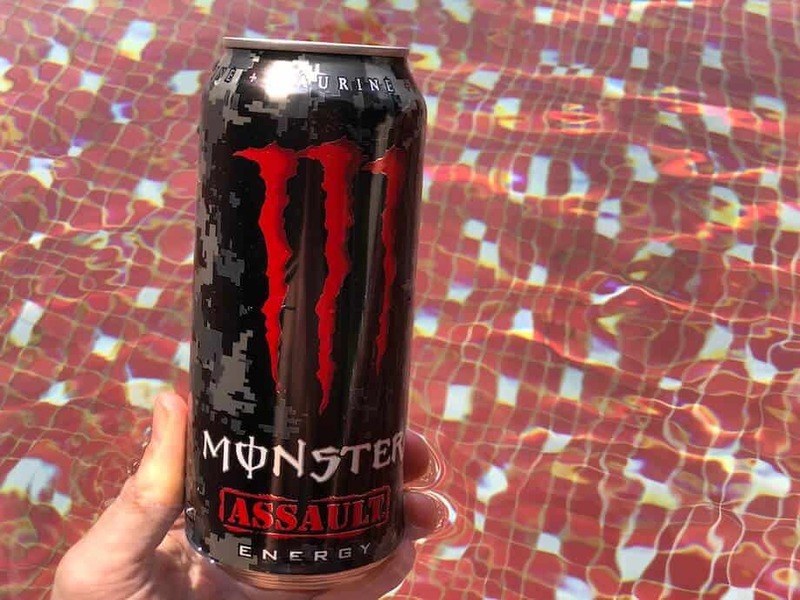 You can also get Monster Assault Energy from your typical gas station or store, such as in places like Target, Walmart, Costco, and most places that you can find your regular Monster Energy drink. One 16 fl.oz can of Monster Assault contains 160mg of caffeine, Monster is similar, with 179mg of caffeine / 16 fl.oz. 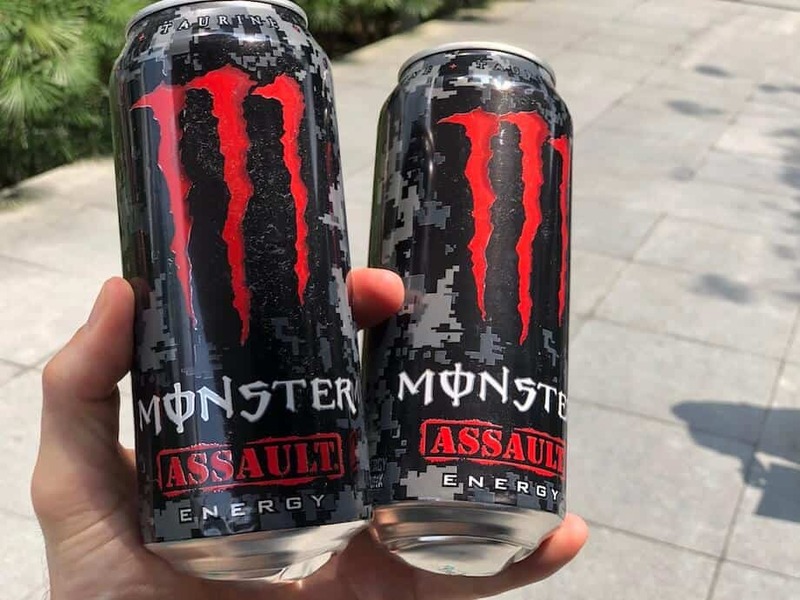 Although they're the same size, regular Monster has a little more caffeine than Monster Assault does, which is surprising, since the word 'Assault' is a lot more aggressive than the actual drink seems to be. Both drinks will put you near the recommended daily caffeine limit if you drink more than one in a day. The difference here is again, negligible, but both also use artificial sweeteners in their drinks, which, when combined with the natural sugar added, really packs a serious punch of sugar. Not recommended for those who are sugar-conscious or on a diet! A single can of Monster Assault costs $3.12, while it is $37.95 for a 12 can pack of Monster Import energy drink on Amazon, which means that it's around $3.20 for a can, excluding shipping. Again, both cost around the same amount of money, but it seems that Monster costs just a tiny bit more - possibly because of the slightly increased amounts of caffeine and sugar. Is Monster Assault Energy Drink worth it? I (and some other reviewers) don't really think so. One 16 fl.oz can of Monster Assault contains 160mg of caffeine, while Red Bull only has 80mg of caffeine / 8.4 fl.oz. Red Bull has half the amount of sugar that Monster does, but it does come in a smaller can. Two cans of Red Bull would be equivalent to a single Monster Assault's caffeine content. There is 50g of sugar in a 16 fl.oz can of Monster Assault, and Red Bull contains 27g of sugar / 8.4 fl.oz, around half of that of Monster Assault. As with caffeine content, Red Bull seems to be exactly half of the sugar content in Monster Assault, but of course, a can of Red bull is roughly half the size as a can of Monster Assault. A single can of Monster Assault costs $3.12, while Red Bull only costs around $1.99 per can. Red Bull is a lot cheaper than Monster Assault, but it's also a smaller can- you're paying mostly for the brand name and reputation at this point, as you are for Monster. One 16 fl.oz can of Monster Assault contains 160mg of caffeine, and Bang has nearly double that at 300mg of caffeine / 16 fl.oz. Bang has really a shocking amount of caffeine, but it does not have as much sugar as Monster Assault does. Bang seems a lot more potent than Monster Assault on these terms, and both are the same size - 16 fl.oz. There is 50g of sugar in a 16 fl.oz can of Monster Assault, Bang energy drink has 0g sugar. But Bang also uses sweeteners- as does Monster Assault. Both use the sweetener sucralose, which has been known to reduce good gut bacteria, which creates health problems in the long run. Monster's combination of natural sugar and also artificial sugar is frankly, quite frightening, so consume in moderation. A single can of Monster Assault costs $3.12, while Bang costs much less, at $2.17 per can. Considering that Bang seems to have so much more caffeine, it should be more effective right? Not quite. Bang is targeted at those who are used to consuming large amounts of caffeine and really need that extra boost, so it works for them. Monster's combination of caffeine and sugar may be more effective for a larger group of people without exceeding the daily recommended caffeine levels. It really depends on how much caffeine and sugar you are comfortable consuming. Monster Assault comes in the flavor fruit punch, and the standard Monster drink size- 16 fl.oz. One 16 fl.oz can of Monster Assault contains 160mg of caffeine, while REIZE only has 50mg of caffeine. 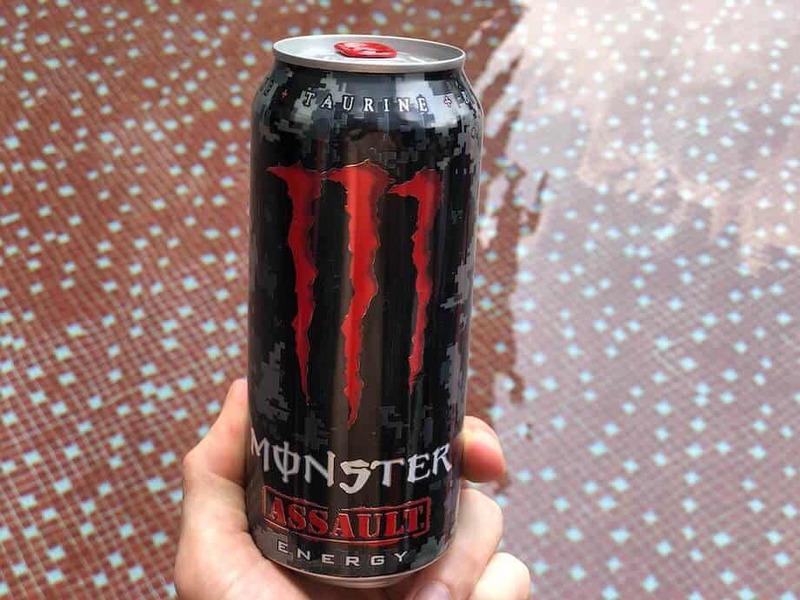 REIZE does not have as much caffeine as Monster Assault does, but it does contain 1000mg of taurine, a substance that has been proven to provide good, clean energy. In contrast, Monster Assault uses caffeine and sugar, both of which cause negative health issues if consumed in excess. There is 50g of sugar in a 16 fl.oz can of Monster Assault, and REIZE is completely sugar free. REIZE does contain artificial sweeteners, but these have been extensively tested- acesulfame potassium and aspartame, the same ingredients used to sweeten Coke Zero Sugar and many other common products. Monster Assault uses sucralose, which does come with potential side effects, and not much research has been conducted on it. A single can of Monster Assault costs $3.12, while REIZE is a lot cheaper, at only around $1 per sachet (including shipping), which can make an 8 fl.oz drink. If you're looking for efficiency that comes at a good price, then REIZE is the drink for you, as opposed to the massively over-sweetened Monster Assault. In addition to that, REIZE is fully customizable- just add the water, juice or sparkling water of your choice in order to enjoy a lovely and energizing beverage. Is it just me or do you guys feel like camo is kind of overrated at this point as well? We've seen it too often, and this camo pattern is a complete contradiction of what the back of the Monster Assault Energy seems to say. Do they want war or not? The association with the military is a pretty obvious, but then there's also the message that they do not want conflict? It's not clear at all! Besides that, I'm not really a fan of the spray paint, 'tough' Monster look- I would much rather have something cleaner and sleeker, but the marketing seems to work for them, so who am I to judge? The color of the drink itself looked pretty suspicious- they use the dye Red #40 to make it more appealing, but all I see is all that coloring entering my system and dyeing my veins bright red. Wow, this was sweet. It had a super cherry-like medicinal flavor that I wasn't really a fan of, but it was also extremely sour! I felt my salivary glands cringe as the drink went down, and it wasn't a super pleasant experience overall. The sweetener was very obvious in the aftertaste- they added sucralose, so the taste of that with the added sugar was entirely too sweet for me. The flavor, fruit punch, was also not very pleasant because it didn't really have a distinctive taste, so I was just left with hints of very artificial fruits. I don't know about you guys, but I'm not a big fan of the very sweet, artificially sweetened taste of Monster Assault. Whatever the taste or the colors, I have to say that it is an effective combination of caffeine and sugar. It definitely gave me a jolt of energy for about 2-3 hours before the inevitable sugar crash & nap. I only drank a single serving of the can, but I did feel that it was a bit stronger than usual, and I felt like I was hovering on the border of being hyperactive- luckily I didn't down the entire can! This also could have been because of the tea I drank in the morning, so that could have also contributed to my total caffeine consumption for the day. If you're curious about what other people have said about Monster Assault Energy, check out this review, which also is not really that impressed with the taste. Another review here is really impressed, waxing about its kick and the pleasant taste. This one provides a comparison between Monster Assault and regular Monster, so you can see how the two match up. All in all, I would give Monster Assault a 5/10. While it is quite effective, there's nothing that really distinguishes it from other Monster energy drinks, and the taste is really rather poor and artificial in my opinion. Another thing that is not appealing is the really massive amounts of sugar and calories within the drink- I think it's not worth the energy boost that you get in return. You could also take a look at Mio water enhancer or Vivarin caffeine pills if you are looking for something that's quick and easy to take. 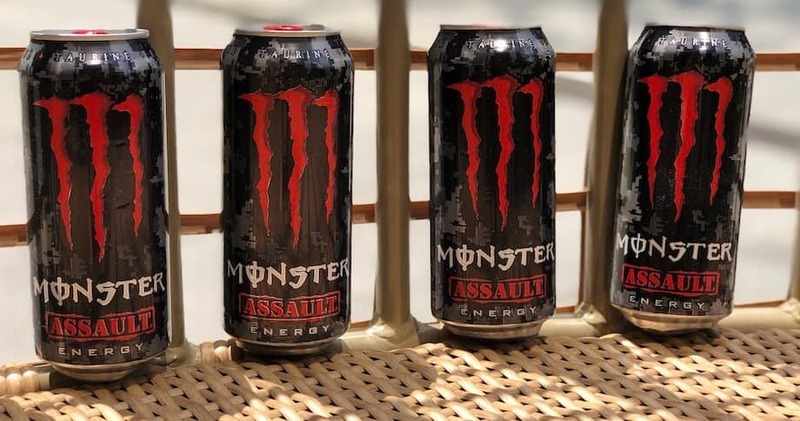 At 200mg of caffeine, it's around the same amount of caffeine that Monster Assault has, but without the great taste. At 50mg of caffeine, REIZE contains a lot less than Monster Assault Energy, but in addition to that, it also contains some other great energy-boosting ingredients that are healthy for you. REIZE is just as convenient and flexible, since you can add all types of liquids to it- soda, hot water, cold water, flavored juice, it's up to you. REIZE ships right to your door for around $1 per drink, cheaper than most of the energy drinks on the market. Give REIZE a try today and you might just find that you prefer it to Monster Assault.